It is essential to use well proven and designed posts. 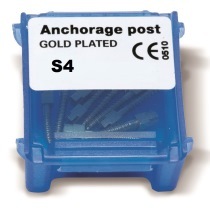 The Anchorage Posts offer you all the safety of far more expensive systems at a very economical price. Anchorage Posts are designed with a parallel sided middle section with an anatomical cone shaped tip for optimum retention and conformity to root morphology. A cross cut head that can be splayed, aid retention of core and crown material. 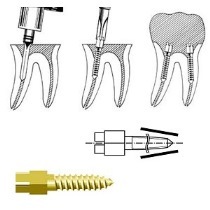 The root canal is prepared with a reamer that matches the shape of the post thus maximizing cement retention while minimizing the risk of root fractures that may occur when using drills or reamers with sharp angle tips. Easy dispenser and keys included. 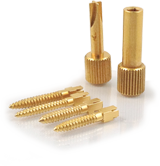 High quality precision finish in a special lead free alloy. Gold plated with a thick layer of 24 K gold. Thread similar to that of a modern self-tapping screw. Easy dispenser and keys included. 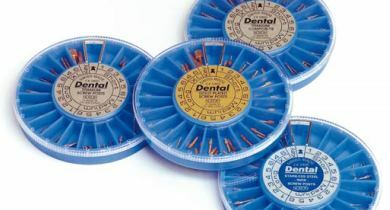 Made from strong 99.8% pure titanium which is tissue compatible and is the metal mostly recommended for human implants. The post reamers are exactly matched to the post for easy placement. Single sizes are packed in box of 3pcs and assorted in box of 6pcs.